Welcome to Eyemouth Harbour – we are a busy and industrious port situated at the heart of the attractive, cosmopolitan town of Eyemouth. Uniquely positioned on Scotland’s south-east coast, the harbour has long been a strategically important base and stopping-off point for all kinds of boats, businesses and people. We are the largest and most secure harbour in the area and offer 24-hour, lock-free access to a deep-water berthing facility. 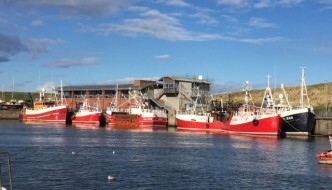 There is ready access to all essential services and supplies for fishing, leisure and commercial boats as you would expect from a busy working harbour.